Forget the inconvenience of programming a car navigation system step-by-step at the last minute. A growing number of automakers are working with Google Maps to offer a “send to car” feature that forwards destination information to a specific vehicle instantaneously––allowing you to call it up whenever you’re ready to go. Users begin at the mapping site, where they find a destination and then choose to send it to a car, opening a pull-down menu that lists participating automakers. When your automaker is selected, an input box will open, asking for your account number, phone number or OnStar User Name. OnStar subscribers will also be prompted to name the address, such as Cousin Amy's House. Click "send" and the next time you use your car's nav system or OnStar it will be in your address book. You input your cell phone number on Google Maps and in the car SYNC TDI uses your cellphone to dial into the Ford network and download the destination to the navigation system. If the vehicle doesn't have a built-in navigation system, the destination will be offered through a version of the TDI app that also downloads spoken directions to SYNC, which plays them through the car audio system. Only a voice plan is required for the cellphone connection; no data plan is needed to complete the downloads. The SYNC system is standard only on Ford’s highest trim-level cars and all Lincoln models; it is a $395 option for mid-trim-level Ford vehicles and not available at all in base-trim-level Fords. 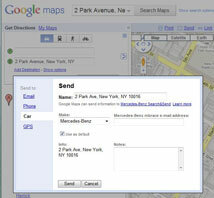 Initially, Send to SYNC will be available through Google Maps. Later this year it will also be offered through Mapquest. BWM calls its system MyInfo via Google Maps and it's available on the 2008 X6 and 2009 and later for all other models. Owners must also have an active BMW Assist account, which is free for the first four years as part of BMW Ultimate Service. On Google Maps you input the email address on file as the account name. When you get into your car, you go to the MyInfo or Message section on the BMW Assist menu and you'll see the address you sent. Mercedes-Benz calls its Google Maps send-to-car ability Search & Send. It requires the automaker’s new mbrace telematics service, which launched earlier this year and costs $280 per year after an initial six-month free trial period. On Google Maps you input your mbrace email address. When you get in your car, you press the mbrace "i" button to dowload the address to the nav system. If you sent multiple addresses, you'll have to press the "i" button for each address. You'll then see all of the addresses. All of these brands are tied to a new service named OnStar eNav, which launched in late June and is provided by GM's wholly-owned subsidiary OnStar. But to get OnStar’s send-to-car feature, the vehicle must have been built within the last couple of years (see OnStar's List). In addition, a subscription to OnStar’s Directions & Connections service package is required, at a cost of $29 per month or $299 per year. On Google Maps you input your OnStar user name and a nametag for your destination. When you get into your car, you press the Phone button and say "Virtual Advisor." Then follow the prompts to download the address to your nav system. In addition, OnStar has been offering an identical feature through Mapquest for several years. Audi is planning to offer destination send-to-car from Google Maps with the navigation system in the forthcoming 2011 A8 sedan, which arrives at dealerships this fall. Looking further out in time, says Thilo Koslowski, vice president and lead automotive analyst at market research firm Gartner in San José, Calif., other mapping and address search websites can be expected to join Google Maps and Mapquest in offering this type of destination send-to-car option, and other more interesting telematics services will emerge as complements, as well. He cites, for example, a new OnStar iPhone app for the forthcoming 2011 Chevrolet Volt that will enable a destination search and send-to-car from the phone. The Send To Car feature is unfortunately missing from Google Maps on Android, so I made an app to bring this very useful feature to Android! With this app, you can now send an address from your phone directly to your car navigation system. All the same cars are supported in the app as on the web version of Google Maps. Try Send To Car on your Android device. It’s free and open source. If you like it, give it a good rating. How did you make the app send to the car? I have a Windows Phone 950 xl and I’d LOVE to be able to do this. I’m a programmer so if someone would just tell me what one has to do, I could almost certainly make it happen. At least in relation to the Generation 8 Lexus voice command system.